As a flooring factory, All Go Flooring turns carpet into custom made and made to measure rugs and mats. We can cut and overlock your carpet remnants to required sizes or provide the carpet to suit your needs and cut and overlock as required. We offer a fast turnaround service and competitive prices. Whether you need a luxury red carpet, customised grass matting for an entertainment area or a large rug to convert a garage to a living area we can custom make it to suit your needs. We produce thousands of mats and rugs for retailers throughout the East Coast every year and have substantial expertise and equipment to customise jobs as required. 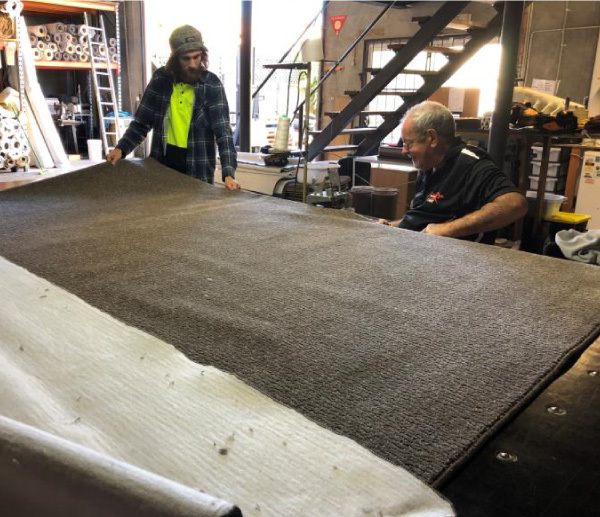 We carry a large quantity of new, high quality carpet remnants from a range of Australian producers in end of roll specials varying up to 6 metres and at reduced prices to suit DIY projects, renovators or carpet layers. We can cut rolls to your size and work around difficult shapes. We offer carpet overlocking services and can measure and cut to your specifications. All Go also provides a full measure, quote and laying service and we guarantee all of our work.